Watch Gov. 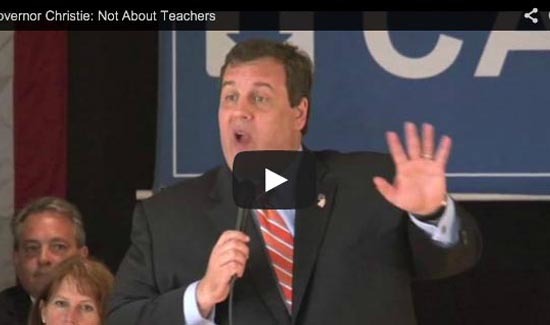 Chris Christie go after the teachers and their union. He calls the New Jersey Teachers union, corrupt bullies. That’s the fight he says. Who is going run our schools? Parents or the mindless, faceless union leaders who use raw power to bully local city councils. No doubt, he feels the same thing about law enforcement associations but he could harbor even more hatred for cops. But he keeps his mouth shut about the cops because he doesn’t dare take them on.